Do you have any “go-to” dishes on menus that you’re pretty much guaranteed to order? For me, it’s any type of tuna tartare. On a brick of salt, on a little cake of crispy rice, drizzled with soy or wasabi or spicy sauce, you name it tuna tartare and I’ll eat it. Skip down to the bottom of this post for detailed recipes! I’ve always been a little hesitant to try to prepare tuna this way at home, mostly because you need to have 100% trust in your source of fresh tuna. As luck would have it, we have Browne Trading Company just a short drive away in Portland, Maine and the last time I stopped in (confession – it was actually just to pick up some wine and cheese! 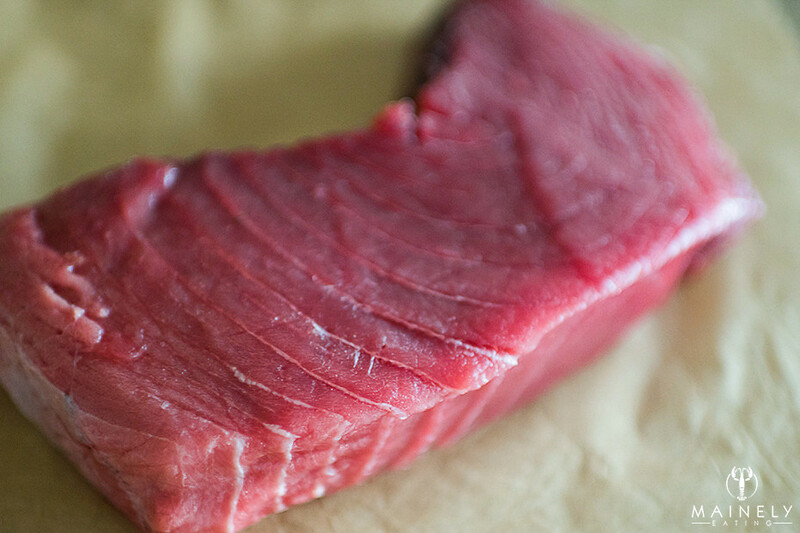 ), it was almost impossible not to notice the huge hunk of fresh red tuna in the refrigerated case. When I asked if it would be OK to eat it raw as tartare, the guy helping me out smiled and said that frankly it would be a crime to eat it any other way as it was so fresh. As Browne Trading Company has nationwide recognition as the very best purveyor of fresh seafood (from Saveur Magazine, the NYT and Food & Wine magazine amongst others) I figured I’d take him at his word. I don’t know about you but the doors of my fridge are literally heaving with bottles and jars of once-used interesting liquids along with staples like soy sauce and sriracha, I decided I’d do a little experimentation to come up with the best sauce for the tartare. If you’ve eaten tuna sashimi you know that naked tuna doesn’t have a particularly strong flavor or taste, if anything it’s the velvety mouthfeel that makes it such a prized commodity in the sushi world. I knew I’d want to add some kind of fat – an oil or a mayo, a citrus-y element (ponzu, lemon or yuzu) and a little bit of heat. Lemon oil & Soy: Lemon infused olive oil, ponzu, soy sauce, squeeze of lemon juice, a little maldon sea salt. This was tasty, refreshing and would be a great option if you don’t eat dairy or you’re not a fan of mayonnaise. I was missing the creamy taste that comes with mayonnaise so I moved on. Citrus and scallion cream: Kewpie mayonnaise, yuzu juice, fresh lemon juice, a little Maldon sea salt, lime zest and finely chopped scallions. This was my husband’s favorite, it was really light and refreshing and didn’t overwhelm the tuna. Spicy sriracha and citrus sauce: Kewpie mayonnaise, Sriracha, fresh lemon juice, dash of soy sauce, a little Maldon sea salt. My sauce of choice. There has to be a reason why spicy tuna rolls are so popular right? I love the heat and depth you get from the sriracha along with the light creamy taste from the mayo and the lemon juice stops it from feeling too creamy or greasy. Yuzu is a fruit found in Japan and looks like a cross between a mandarin and a grapefruit. Small bottles of the juice can be found in most Asian supermarkets, it’s definitely worth picking up a bottle as it can also be used for making Yuzu lemonade or other cocktails. Ponzu is a citrus sauce (likely to contain some Yuzu juice) commonly used in Japanese cuisine. It’s not as intense as Yuzu juice. It’s tart, with a thin, watery consistency. You might also use Ponzu Shoyu (mixed with soy sauce) and adjust the other ingredients accordingly. Kewpie mayonnaise is made and imported from Japan. It’s a yellow color and the taste is richer and more creamy than most mayo you’ll find in the US. It’s made with rice vinegar to make it more complimentary to Japanese cuisine. 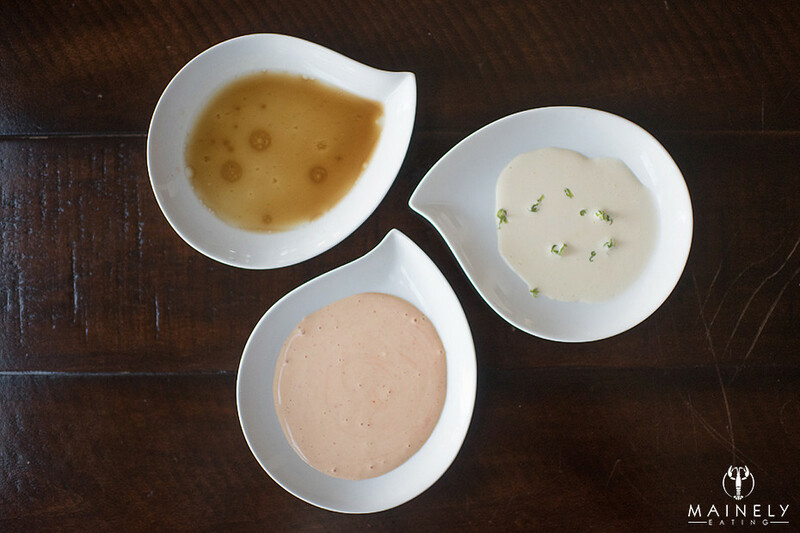 So now I had my sauces prepped, it was time to chop my tuna. All you really need is clean hands and a very very sharp knife. We bought just under 1lb of tuna so we had a LOT of tuna tartare to get through! I’d say you could probably buy 1/2lb and still make 24-36 tuna tartare canapés depending on their size. 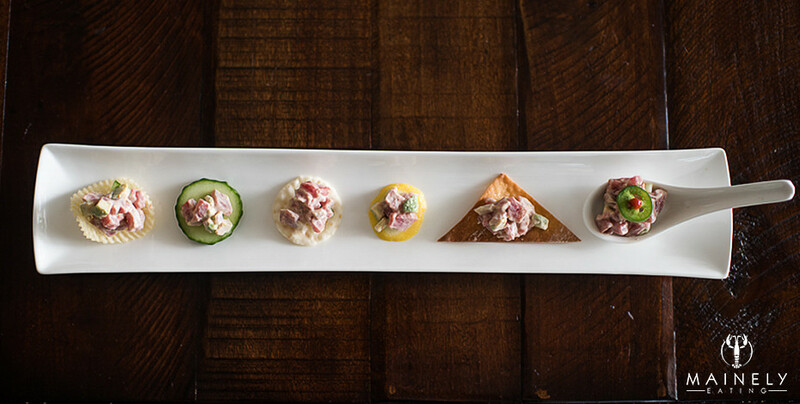 I’m not a fan of the overly chopped tuna mush you sometimes get in disappointing sushi restaurants, I wanted little square jewels of tuna that would just melt in your mouth. It’s also worth taking the time to remove any sinewy pieces – nothing worse than taking a bite and finding a chewy sinew. 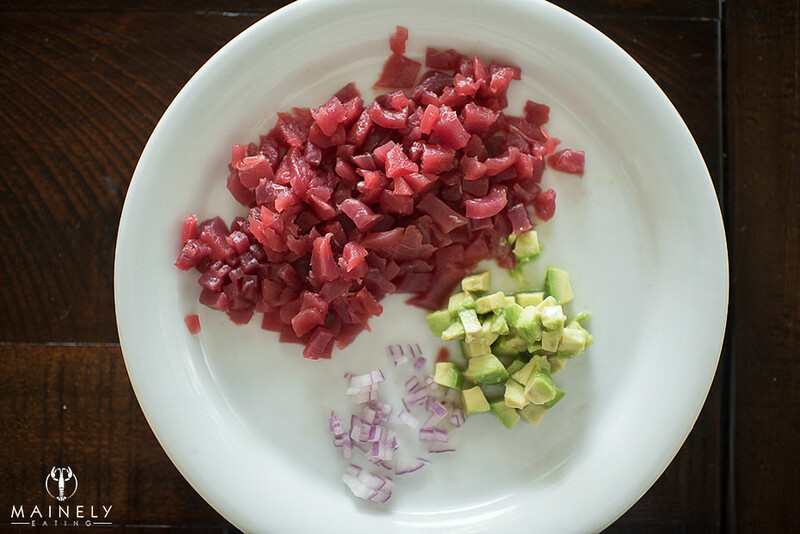 Here’s the first batch chopped, maybe 1/4lb of tuna, some avocado and a little finely chopped red onion for a little crunch. For the second batch I skipped the red onion as it was a little overpowering and switched to finely chopped European cucumber (sat on a piece of paper towel for a minute to absorb excess liquid). Waffle potato chip: The gentle and soft texture of tuna benefits from a little crunch and salt so I enjoyed this (you can make your own chip although I think it’s hard to beat a lightly salted Cape Cod chip). You might want to adjust the seasoning in your cream/sauce to account for the extra salt on the chip. If you’re entertaining it would be wise to buy a couple of extra bags of chips in case you have broken chips you can’t use. Chinese soup spoon: Super affordable from Amazon or a local Asian market, I think they look pretty fancy. Not to mention you’re just enjoying the tuna alone without the distraction of anything else. I fancied up my spoon by adding a very thin slice of jalapeno and a little dab of sriracha for extra heat. Wonton wrappers: Pick up a packet of square wonton wrappers in the supermarket and chop each square into two triangles. Brush lightly with a neutral oil (mix in a little sesame oil if you like the taste) and bake for 5-7 minutes at 350 degrees. It’s crunchy and looks fun but the size is a little awkward. I think a good canape should be a one-bite experience and this was sort of a one-and-a-half bite with the potential for the wonton shattering and covering you in crumbs. Rice cracker: Perhaps more fitting than a potato chip and still gives you the salty/crunchyness that works so well with the softness of the tuna. Highly recommend. Lemon: looks bright and fresh but probably the least practical. You can’t actually eat the slice of lemon (if you’ve invited friends over for cocktails are they now holding a soggy piece of lemon – awkward!?!?) but the extra citrus flavor was really lovely. There was something about this I really liked. 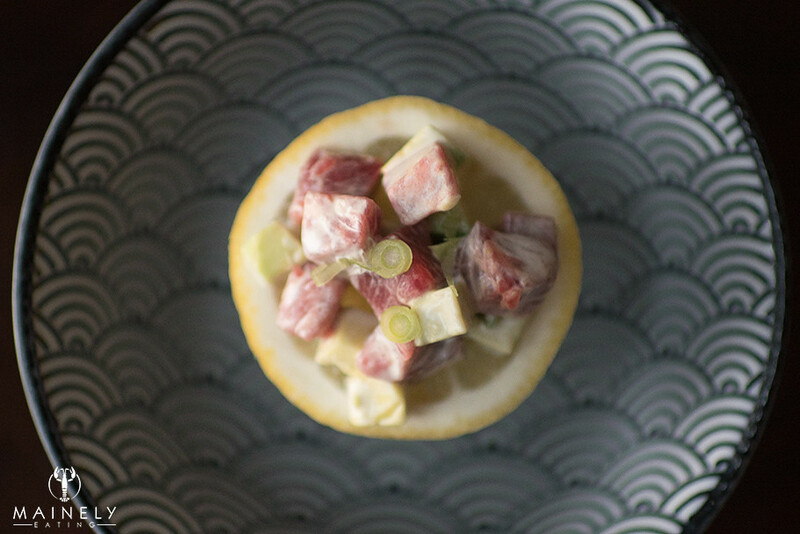 As I mentioned we had a LOT of tuna to get through so I figured although the lemon slice doesn’t really work for a canapé it works beautifully if you wanted to make a tuna tartare appetizer for a seated dinner. After eating a lot of tuna tartare canapés with relatively simple bases, I figured it was time to up my game. Anytime I’m at a wedding or an event and there are hors d’oeuvres served in cones I’m all over them. Cones are festive and feel special and luxurious. Frankly you could put a chopped-up hot dog in a cone and I’d coo over it and likely take two. A quick google gave me this recipe. – Line a cookie sheet with parchment paper. Ideally you’d use a silpat but I don’t bake a lot so don’t have one. Dollop a scant tablespoon of mixture on the parchment-lined cookie sheet. – Bake for 8-10 minutes. Flip (see notes below) and bake on other side for 8-10 minutes. 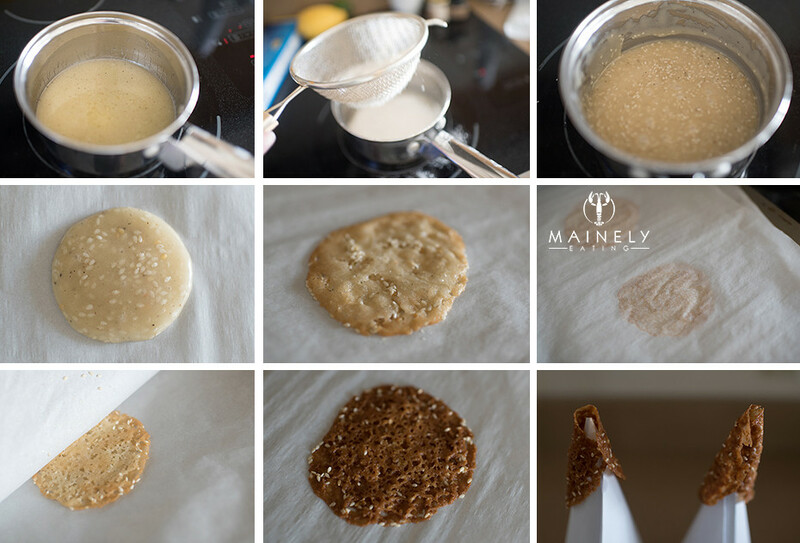 – Remove from oven and WORK FAST to form into a cone shape. – Let cool and fill with anything you like. 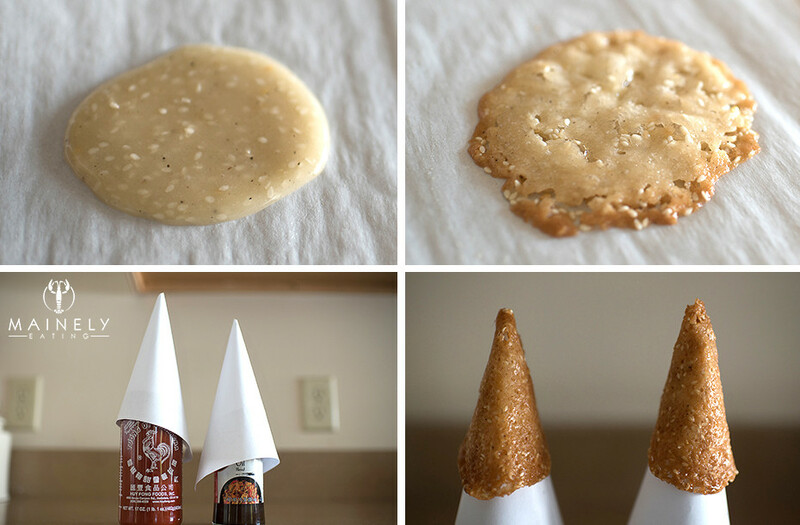 I improvised using a couple of sheets of parchment paper to flip my batter over, and a couple more pieces of parchment paper and paper clips popped on the top of bottles for my cone stands. The first batch I made were way too dark and overcooked after 10 minutes, I found 8 minutes was just about right. You have to work CRAZY fast to roll the hot “cookies” into cones when they come out of the over. I baked them in batches of two at a time. If you’re more proficient than me you could maybe do 3 or 4 at a time. I had two cookie sheets going so I had a batch of two to roll every four minutes. You want to try to get the tight roll of the point of the cone first as that requires the most “bending” of your cookie, once you have that (and hopefully your cone hasn’t shattered) then you can shape the wider end of the cone. I felt the cones were a little dense so I added a half spoon more of corn syrup and a half spoon of water to thin the mixture. I also spread my mixture a little thinner and in slightly more of an oval shape to give my cones more of a chance of not gaping at the scenes. Mostly I learned that caterers who churn out hundred or thousands of these little babies deserve some kind of award for precision and patience! The second batch were easier to roll, nicely cooked and yes, they looked pretty darn impressive. Especially when I added some super thin batons of cucumber and the tuna and put them in my fancy cone stand. But here’s the thing – they tasted pretty darn awful. I’m assuming the corn sugar is used to give you the pliable nature of the cones but they were so sweet! I was reminded of these ancient cookies I used to get in the UK called brandy snaps. They looks great but it just seemed wrong to put the perfectly fresh tuna inside these sweet and thickly crunchy cones. So I went back to my friend the google for some help and stumbled across the genius idea of using wonton wrappers to make cones. No mixing, no burning of fingers with hot cone shapes, just roll up a wonton wrapper, moisten with a little water along the seam, pop in a little aluminum foil ball to keep the wide end of the cone open, bake seam side down and boom! 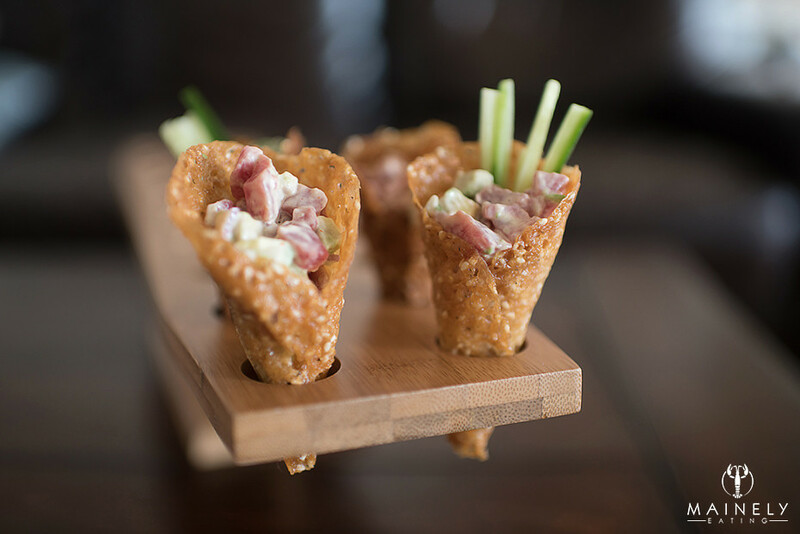 Easy peasy canapé cones that are just yearning to be filled with tuna tartare. 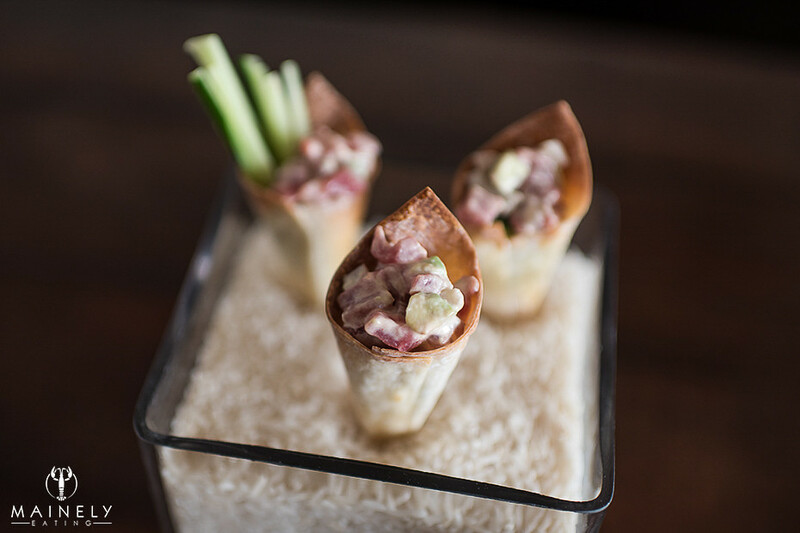 And here’s another cute serving suggestion for your tuna tartare cones, fill a vase or other container with rice (I hid a upside down espresso cup in my vase to take up room and waste less rice) and nestle your cones in the rice. Et voila! There you have it, my adventures with making tuna tartare at home. If you can get your hands on some sushi-grade tuna you should have a go! I’m planning my next cocktail and canapé party for the holidays and these will definitely be on the menu! 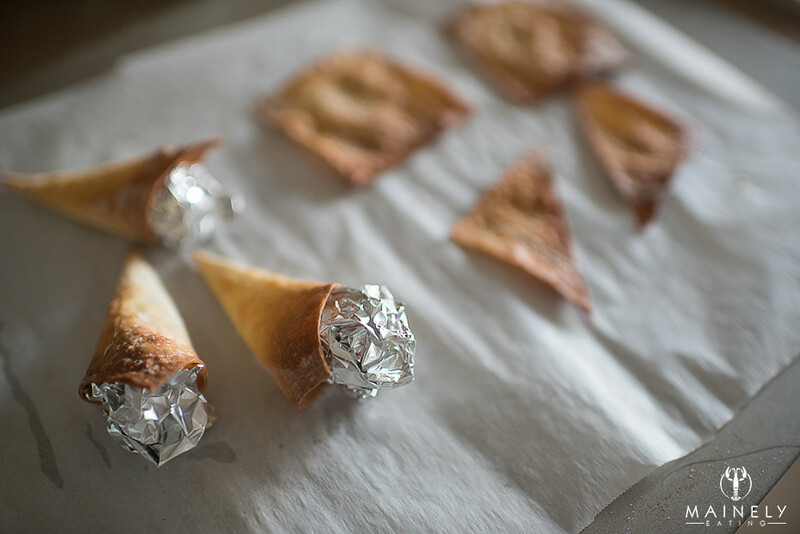 If making wonton cones,preheat oven to 350 degrees F. Line a cookie sheet with parchment paper. Roll up 12 2 inch squares of aluminum foil into little ball shapes. One at a time, take a wonton square and add a little water to one edge. Roll to make into a cone shape and use the water line to seal. Place cone on cookie sheet and pop a foil ball in the opening to prevent cone from collapsing. Bake 12 at a time for 7-10 minutes until golden and crisp. Let cool. 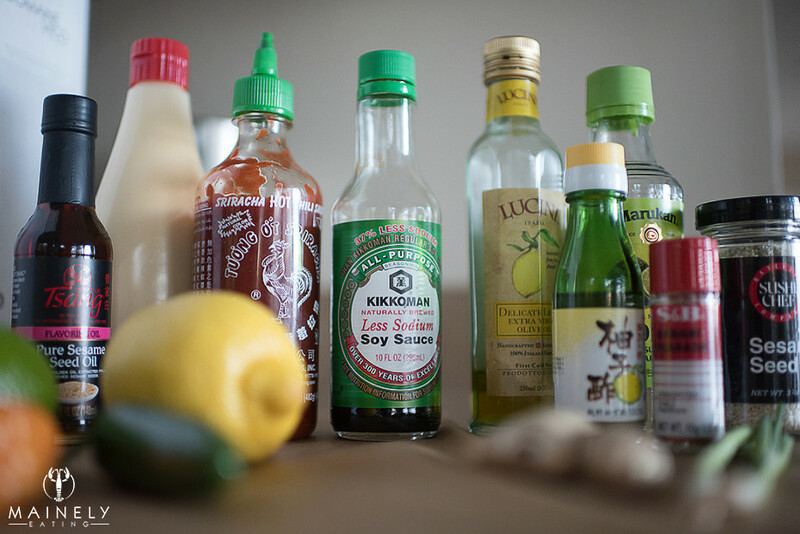 Mix ingredients for sauce together. Taste. Add more lemon/salt/siracha etc to taste. It should be zingy and fresh! Serve immediately! This is not a make-ahead recipe! 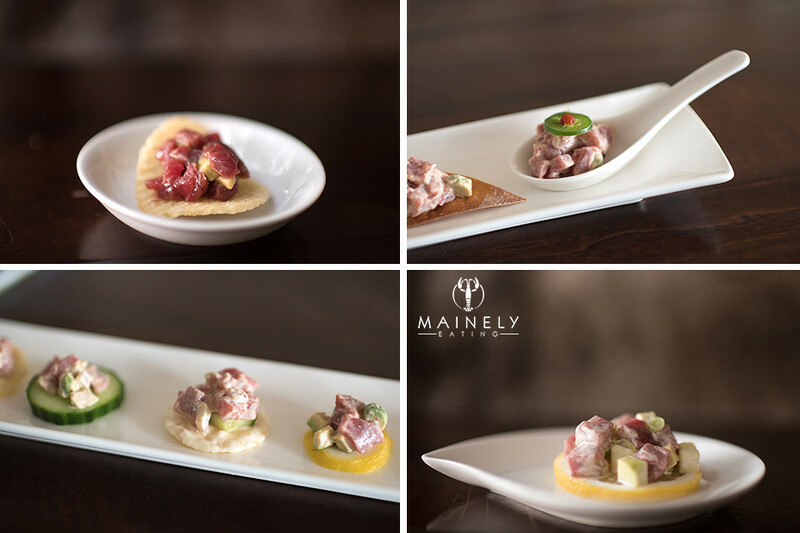 This entry was posted in Entertaining, Hors d'oeuvres and tagged canape cones, canapes, sushi grade tuna, tuna tartare canapes, tuna tartare in cones, tuna tartare recipe by Mainely Eating. Bookmark the permalink. My mouth was watering the ENTIRE time I read this post. Thank you for this!